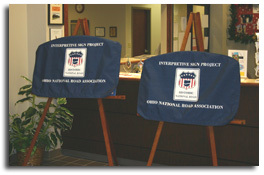 The thirteenth and fourteenth Ohio National Road Interpretive signs were unveiled in Cambridge on December 3, 2010. 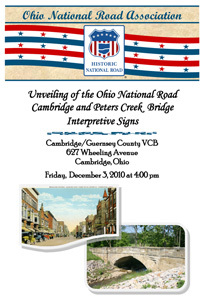 These signs, commemorating the history of the Peters Creek “S” Bridge and the City of Cambridge, were on display in the lobby of the Cambridge/Guernsey County Visitors & Convention Bureau, located at 627 Wheeling Avenue (the historic National Road –U.S. Rt. 40) in Cambridge, Ohio 43725. 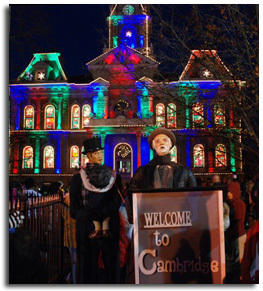 The unveiling ceremony was held during the Dickens Victorian Village Holiday season, in which the historic Guernsey County Courthouse Holiday Light Show is a centerpiece attraction on the National Road in downtown Cambridge. Dickens Victorian Village Tour Coordinator Jonett Haberfield (at left) stopped by to greet us and is shown with VCB Executive Director Debbie Robinson, who welcomed guests and served as the master of ceremonies for the unveiling. Also participating (at back right) was Fran Taylor, Director of the Cambridge Main Street Program. A reception which followed was hosted by the Visitors & Convention Bureau . 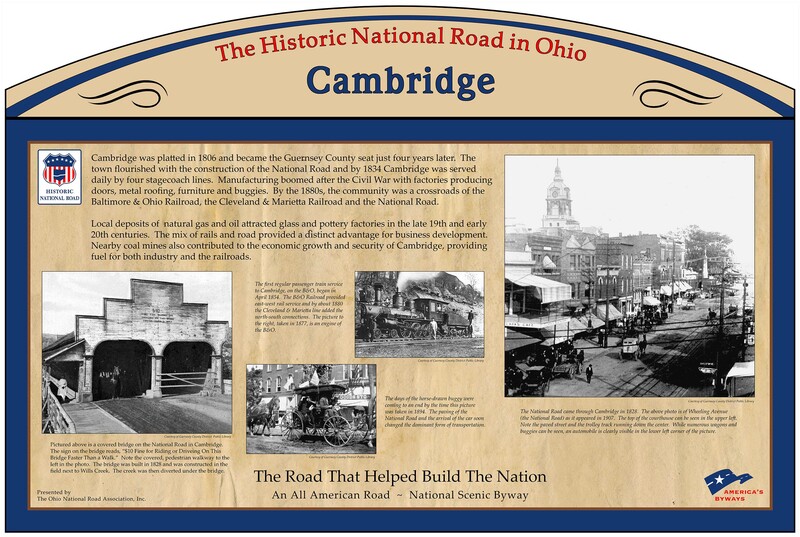 Due to a scheduling conflict, Cambridge Mayor Tom Orr was unable to attend the ceremony, so the Cambridge Interpretive sign was unveiled by City Engineer Paul Sherry and Ohio National Road Association President Cyndie Gerken. The sign will be installed in Downtown Cambridge upon completion of the City’s streetscape project. 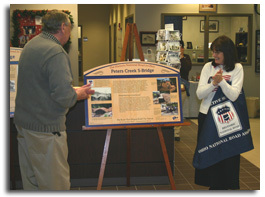 The Peters Creek “S” Bridge Interpretive sign was unveiled by Ohio National Road Association Board member Ed Wagstaff and President Cyndie Gerken. When the weather permits, this sign will be installed by the restored “S” bridge which once carried the National Road across Peters Creek, about four miles west of downtown Cambridge. 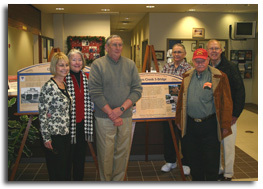 Pictured (left to right) are members of Project Pride who created both the Historic Downtown Cambridge Walking Tour and the Guernsey County National Road Driving Tour brochures, and who sponsored the Peters Creek Bridge Interpretive sign: Debbie Robinson, Liz Sperandeo, Ed Wagstaff, Bob Lahmers, Bob Oess and Tom Dilly. 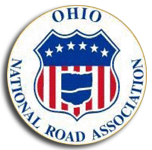 Current and former ONRA Board members were on hand for the unveiling and are pictured (left to right): Board President and Miami County rep Cyndie Gerken, Licking County rep Charla Devine, Muskingum County rep Mary Ellen Weingartner, Licking County rep Larry Bicking, former Guernsey County rep Liz Sperandeo, and (in back row) Guernsey County rep Ed Wagstaff. 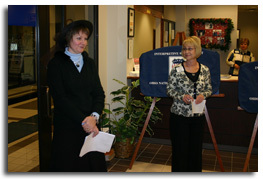 Also in attendance (not shown) were Hebron Historical Society Treasurer Marsha Justice, Linda Wagstaff and Liz Bicking. 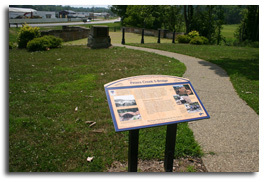 Shown is the Peters Creek S-Bridge Ohio National Road Interpretive sign which was subsequently installed at the actual site. Peters Creek S-Bridge is in Guernsey County on the north side of US 40 at Peters Creek Road, just west of Cambridge. The 1828 stone arch bridge can be seen at the end of the sidewalk behind the sign, with vehicles on US 40 showing in the background beyond the bridge. 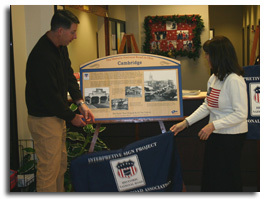 Shown is the Cambridge Ohio National Road Interpretive sign which was subsequently installed along Wheeling Avenue (historic National Road) in downtown Cambridge. The sign can be found in front of the old I.O.O.F. building (the former Tingle Tavern) at 624 Wheeling Avenue, next door to Theo’s Restaurant and across the street from the Cambridge-Guernsey County VCB. 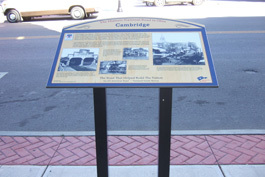 This sign, commemorating the City of Cambridge, was “unveiled” previously, but it could not be installed until the completion of a streetscape project in 2013.